Few things are as stressful to homeowners as water damage. It can be a sinister, creeping issue that many don’t discover until it has become a big, expensive problem. At its worst, moisture has the potential to damage your home beyond affordable repair, with heavy structural consequences that include mold, wood rot, and even foundation cracks. If you’re lucky, you’ll catch it early and stop it before it spreads. But even small leaks that allow rainwater into the house can require major repairs to keep moisture at bay. The best way to deal with water damage is to stop it before it starts. Here are measures that you can take to prevent water from entering your home from outside. The exterior of your house is its first line of defense against water damage. Protect your home from the outside in by maintaining the exterior. Properly handling the water that flows down your roof is essential. 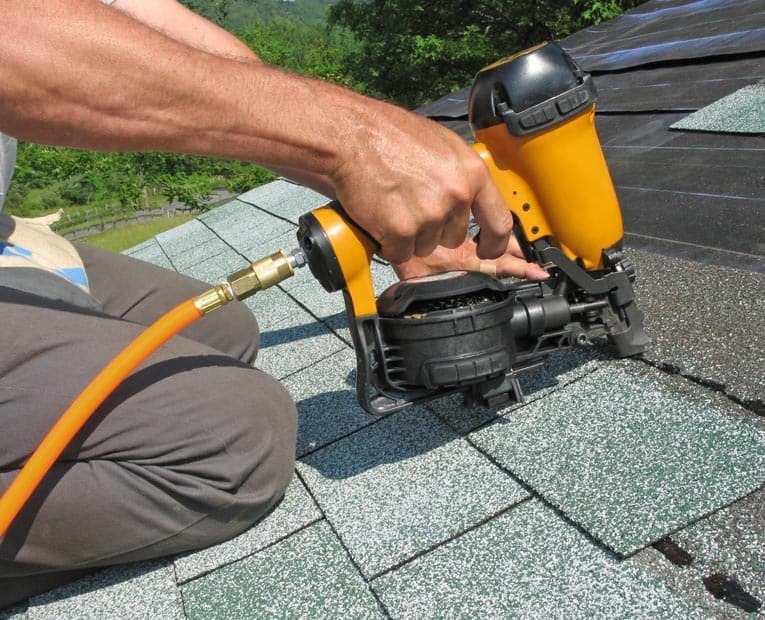 Your roof’s primary purpose is to keep water out of your house. Neglecting it could lead to a whole host of problems, the worst of which includes extensive water damage that could compromise the structure of your home. Most roofs have a lifespan of 20 to 30 years, so it’s easy to think that if yours is still within its period of usability, it’s fine. But that’s not necessarily true. Climate, weather conditions, and even nearby trees can cause damage to roof shingles. Periodically inspect your roof for damaged, loose, or missing shingles. Replacing any shingles that are missing or in poor condition is a quick and inexpensive project that can extend the life of your entire roof. Windows and doors are common vulnerable sites for water leakage. Water can seep in through the space around window and door frames if they’re not properly sealed. Don’t wait for a leak. Ensure that the weatherstripping and seals around your windows and doors are in good shape. Inspect the outside of your windows and doors. Any large cracks between the frame and the house can be injected with insulating foam sealant. Prevent other leaks by applying a fresh bead of caulking where the window meets the siding. Even a fresh coat of paint on window and door frames can block moisture from penetrating the wood. Signs of water damage on your house’s interior walls that don’t seem to have a source, such as mold, peeling paint, or discoloration, could be due to water entering through holes in your exterior walls. If your siding and exterior paint aren’t well-maintained, water could be leaking through to the inside of your home. Periodically inspect your exterior walls. Look for signs of damage in your siding, such as holes, wood rot, or warping. If caught early enough, you may be able to clean out the wet materials and repair only the affected siding. Most common exterior siding, including stucco, aluminum siding, wood siding, and cedar shingles, need to be painted in order to protect your home properly. Paint adds more than just aesthetic appeal—it seals and protects your siding against rain, sleet, and snow. You can take measures to keep water out of your home, but waterproofing alone isn’t enough to protect your home from water damage. If water isn’t properly diverted away from the base of your house, your foundation could be at risk. And even the best waterproofing measures are no match for standing water that collects on or around your house in areas of poor drainage. Depending on surrounding tree coverage, gutters need to be cleaned out two to six times a year to ensure proper flow of rainwater. Making sure your gutters function properly is critical to protecting your home from water damage. If your gutters are full of leaves and pine needles, or not angled properly to funnel water to the downspout, then water will run down the side of your house and collect at the base, which could put your foundation at risk. 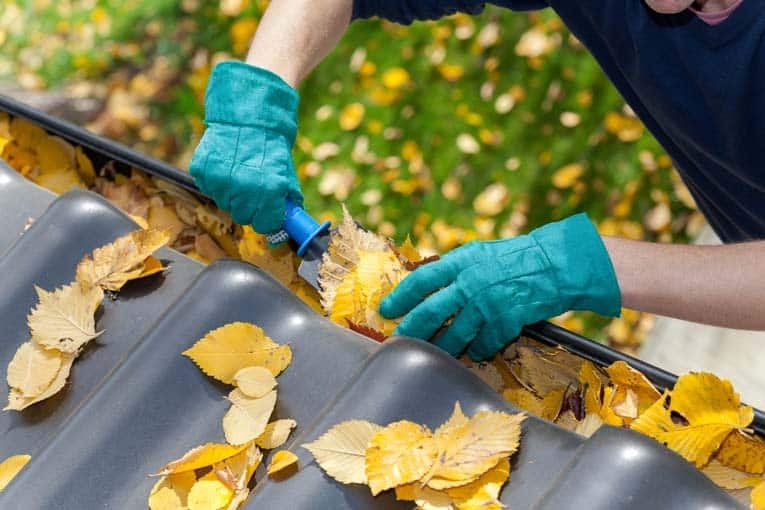 Start by clearing built-up gunk from your gutters. If your gutters are too high to reach with an extension ladder, you may want to hire a professional. If you can reach them, then this is a job you can easily do yourself. Begin near the downspout, using your hand or a plastic gutter scoop to dig out the muck. Once gutters are cleared of obstructions, use a pressure washer to clean them. Downspouts should direct water at least three feet from the exterior walls of a home. Functioning gutters send water out through the downspout, which should funnel the water away from your home. 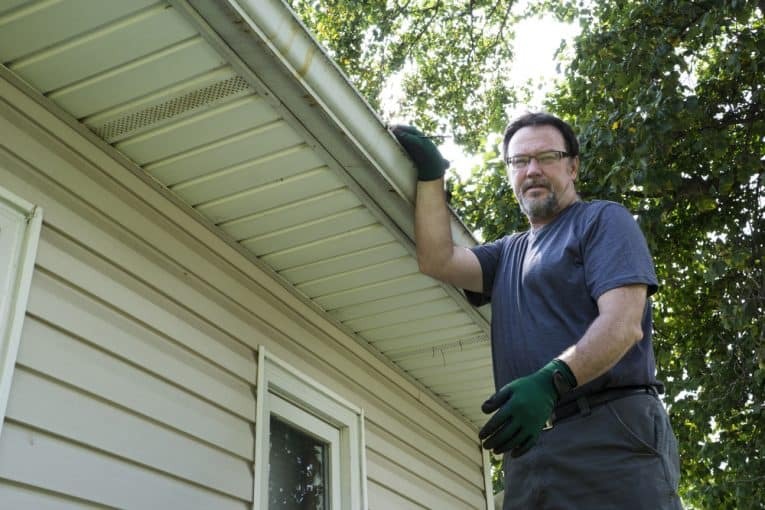 If necessary, repair gutters and downspouts. If the downspout doesn’t extend far enough, then it could instead be funneling water directly into a puddle at the bottom of your house. Downspouts should extend at least two to three feet from the house. However, the length of the downspout extension you need depends on your house and surrounding property. 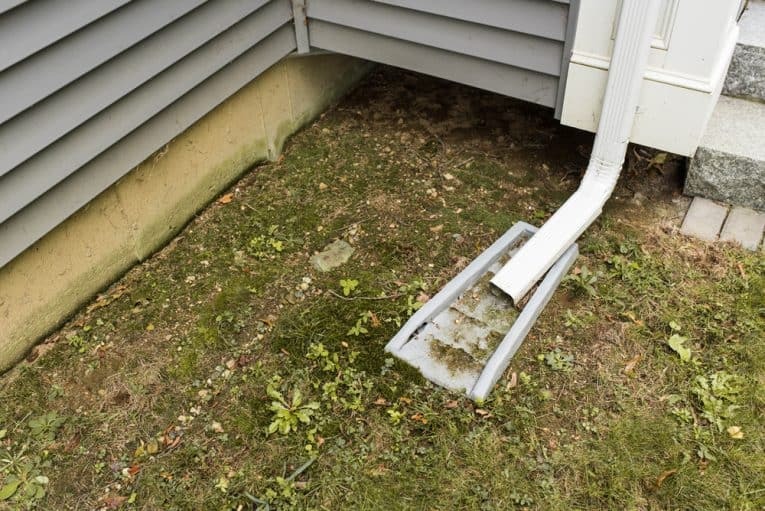 If your downspout is long enough, but you can still see water collecting at the base of your house, then you may need to install a drainage pipe—a relatively simple and inexpensive DIY project. If your home sits on the bottom of a slope, water runoff from your yard should be channeled away from your home. If it isn’t, then you probably have problems with standing water near your foundation. Over time, this can cause the ground near your foundation to erode, making it vulnerable. A French drain could be a simple solution to direct runoff away from your home. At its most basic, a French drain is a simple trench filled with gravel; you could install one with or without a pipe. For an average cost of $1000 to $1500, this solution could save you a lot of money on foundation repairs in the future. Of course, water damage isn’t limited to rain. 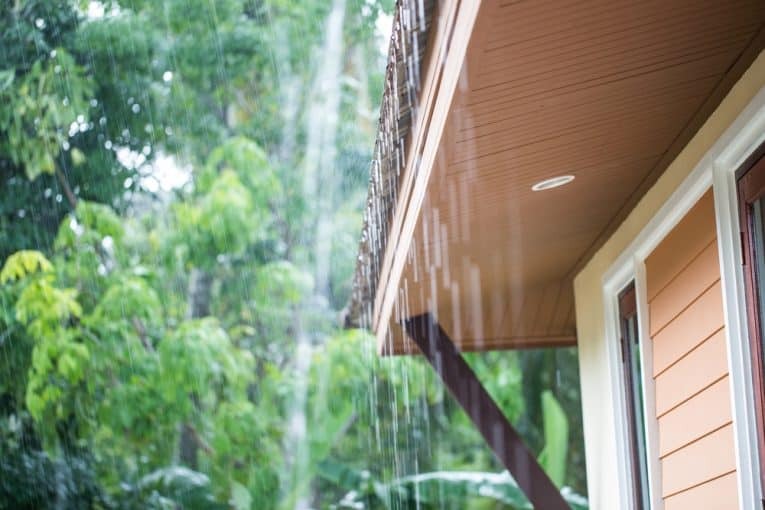 Leaking pipes and valves inside your home can cause problems just as severe as rainwater intrusion, but your home’s protection begins with its exterior. Ensure that your roof, exterior walls, gutters and landscape are working as they should to keep your home high and dry. Robert Kociecki has over 15 years of experience managing residential and commercial properties across the United States. He serves as Senior Vice President of Property Management and Renovation at Altisource, parent company of Owners.com, where you can track a home’s history and save money listing your own (rainwater-resistant) house.